In the book Chaunie shares her own story, about her unexpected pregnancy in her senior year of college. Her honesty throughout the book makes it easy to read, entertaining and helpful. She shares stories, inspiration and the answer to the infamous question “What am I going to do now”. Personally, I am so thankful that this book is out! I know I will be recommending it a lot and even purchasing it for young mamas that I meet. I have some pretty strong views about unwed mamas, I believe we should be loving on and supporting them and helping them in every way we can. Motherhood is hard enough, unexpected motherhood comes with it’s own set of unique challenges, we should be helping these mamas through instead of making them feel guilty or ashamed for something that can’t be changed now. 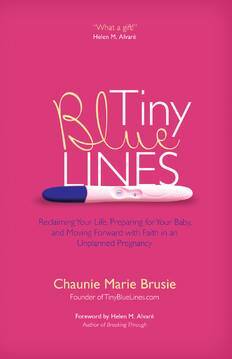 I love that Chaunie has provided so many helpful resources in her book, especially for young moms who are in college. This is such a great book to give as a gift and a great way to show your support for a friend who may be facing some unepected blue lines of her own. Or, maybe it’s the perfect thing for YOU if that is were you are at right now! Chaunie has graciously given me a copy of her book to give away to one lucky reader!!! I encourage you, even if you are not facing an unexpected pregnancy, to get Tiny Blue Lines for a friend or acquaintance if you know some one who is in that situation. It can be a great way to show your support and love for the new mom and her baby! Hey Buddy!, I found this information for you: "Tiny Blue Lines – Book Giveaway". Here is the website link: https://www.beautythroughimperfection.com/tiny-blue-lines-book-giveaway/. Thank you.